This isn’t quite like Russell’s paradox. He asked whether the set of sets which contain themselves contains itself. If it does, it doesn’t. If it doesn’t, it does. This logical contradiction led to a more rigorous construction of set theory that avoids the paradox. My observation about Betteridge’s law isn’t a paradox, though it resembles one. If Betteridge was wrong, there’s no contradiction in saying that he was sometimes but not always right. 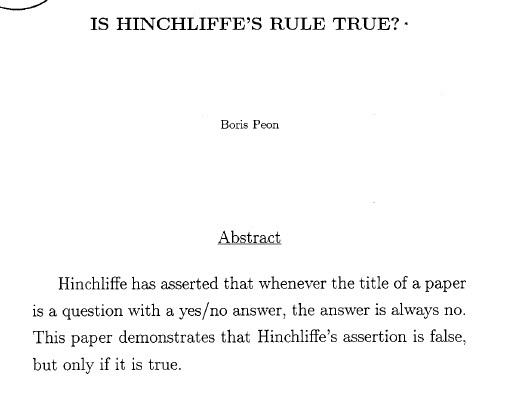 Betteridge’s law was an aphorism, not a logical absolute, and so was never intended to be a rigorous statement. I’m sure Betteridge was quite aware that there had been exceptions, or at least that one could easily create an exception. He did so himself. But as is often the case with yes/no statements that are not always true, it can be turned into a rigorous statement using probability. Betteridge could have said that if a headline ends in a question mark, the probability that the answer is no is large. Then my headline, added to the vast collection of headlines, would ever-so-slightly lower the proportion of headlines that ask questions that can be answered negatively, without contradicting Betteridge, if was right. Thanks to Don Sizemore for pointing out Betteridge’s law. Good Afternoon from Prague John. Actually, I think that Russel’s paradox is that the set of set that doesn’t contain themselves contains itself. Great blog! I enjoy every article! To keep readers guessing, a journalist could flip a coin before writing a headline, then pick a question whose answer is “yes” if and only if the coin comes up heads. There’s no paradox in the answer “no”, due to the universal quantifier present. This is like doing a comprehensive study of all published statistics and determining the number that are made up. When you publish this new statistic, your work is then ever so slightly wrong. This is essentially Liar’s paradox. The point is that when a headline or article title takes the form of a question, the question is a leading one; the author is trying to push the reader towards one answer or the other, but I have (at a guess) seen as many yes’s as no’s. This may be hwy some journals will not accept papers whose titles are questions. On one hand, at I read the ‘law’ the headling “Was Betteridge right?” CAN be answered as no, it can equally be answered as yes. The law doesn’t claim that either answer is true. On the other hand, the example offered by Frank Wilhoit, along with countless others “Who Really Killed JFK?” or “What is the Answer to Life, the Universe, and Everything?” are clearly counter-examples to the “law” since they are not predicates and can’t be answered yes or no. I don’t know the context of the quote, but the aphorism is interesting. The idea seems to be that leading questions as headlines tend to be used by journalists how want to suggest an interpretation that is not warranted by the data alone. In that sense, a question for a headline is a good “marker”/correlate for dubious assertions and the answer will often be “no”. > He asked whether the set of sets which contain themselves contains itself. If it does, it doesn’t. If it doesn’t, it does. Shouldn’t that be ‘set of sets which _do not_ contain themselves’?